Peoples of African descent are a vibrant part of Nova Scotia’s past, these individuals made Nova Scotia home and contributed to the fabric and success of today’s province. Nova Scotia can be said to be the birth place of Black Culture and heritage in Canada, boasting the largest indigenous Black community in Canada. Today these rich settlers make up the African Nova Scotia community and today over 400 years later call Nova Scotia home. They settled in 52 historic communities, such as some of the well known communities of Shelburne, Africville, East Preston, Annapolis Royal, Cherry Brook, Halifax, Sydney, Springhill, North Preston, and Beechville to name a few. 1782-85 About 3,500 Black Loyalists fled to what is now Nova Scotia and New Brunswick at the close of the American Revolution. They had fought for Britain in return for freedom. Once in the Maritimes, they were cheated of land, forced to work on public projects such as roads and buildings and denied equal status. 1792 Exodus to Africa: 1,190 men, women and children left Halifax on 15 ships for the long voyage to Sierra Leone. Sixty-five died en route. 1796 Nearly 600 Trelawney Maroons exiled from Jamaica arrived in the Maritimes. They faced miserable conditions and opted for Sierra Leone. They left Halifax in 1800. 1813-15 Roughly 2,000 U.S. 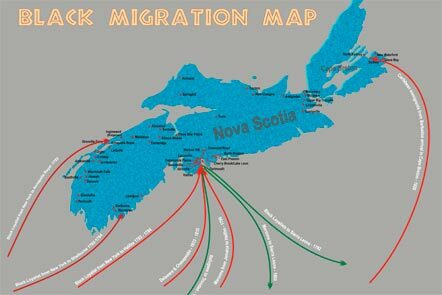 Blacks, refugees from the War of 1812, settled in the Maritimes. 1833 Slavery officially abolished in the British Empire. 1920s Hundreds of Caribbean immigrants, called the “later arrivals,” flocked to Cape Breton to work in coal mines and the steel factory.